So are you saving enough (or too much) for your retirement? Given your age and income, do you know how much you should set aside every month now so you can have enough fund to cover your daily expenses when you are at age 65? In the April issue of Journal of Financial Planning, a group of scholars and financial professionals published a report on individual’s savings rate in preparation of retirement. The report, National Savings Rate Guidelines for Individuals, provides the “savings guidelines for typical individuals with different ages, income levels, and initial accumulated wealth” such that we can use the guideline to assess our saving plans and see how much we need to save for retirement. The motivation of the study is the increasing dependence on personal savings via defined-contribution plans such as 401(k) plans to pay for retirement for future retirees. The study also aimed to help people to determine the total assets needed to fund their retirements. To calculate the savings rates, we calculate income needed in retirement based on retirement income as a percent of net pre-retirement income, which we define as gross income less the amount saved for retirement each year during pre-retirement. Basing retirement costs on pre-retirement net income rather than gross income, as done with other studies, significantly reduces the amount that must be saved. forces an individual to save more and to make a more radical reduction in current lifestyle, resulting in excess capital that can generate an increase in lifestyle upon retirement. In short, the amount saved could theoretically be too much and provide a higher standard of living in retirement than while working. With these assumptions, the study comes up with savings rate guidelines for individuals at different ages (from 25 to 60) and with different income levels (from $20K to $120K a year). The guidelines have two parts. The first part assumes that one needs to replace 80% pre-retirement gross income at age 65 when retirement begins. 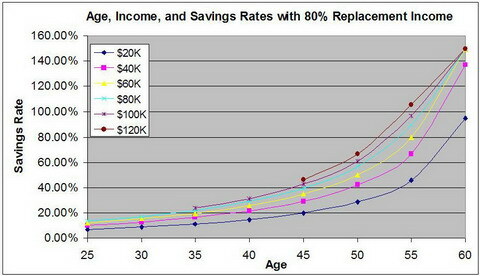 The savings rates are shown in the plot below (click to enlarge). While there’s no surprise that the older you are and the more you make, the more you need to save, what seems to be extraordinary from the report is that if you are 60 now and make $60K a year or more, you will have to have a savings rate greater than 150% in order to reach your retirement goal. 150%? Is it possible to save more than what you earn? These numbers could be theoretically true, but not really realistic. On the other hand, it could also suggest that if you start to save very late, you can’t hope too much in replacing most of you pre-retirement incomes. For many people, a lot of current obligations such as mortgage and college expenses will disappear when they are 65, thus a 80% pre-retirement income may not be necessary. 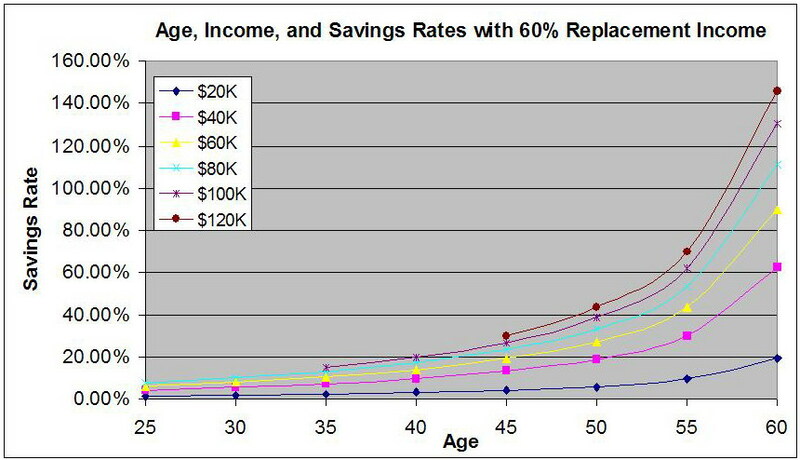 If this’s the case, the report also provides savings rates with 60% replacement income as shown above (click to enlarge the picture). 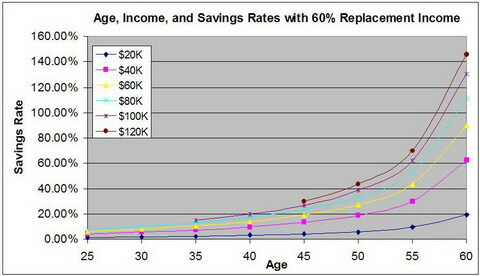 Again, for people who are already 60 and making $80K or more, a 100+% savings rate is needed. With these savings rates and expected replacement income level, the report offers a table with assets needed at age 65 to fund retirement with adequate cash flow. The studay assumes that to generate the retirement cash flow, assets “would be invested in inflation-indexed lifetime fixed-payout annuities.” For example, if you make $80K a year at the time when you retire at age 65 and have a net income (gross minus annual savings) of $66,880, then a 80% replacement income in retirement will be $53,504. If you receive the full benefit of social security which will give you an annual income of $25,252 and with no pensions, then you will need generate the rest of $28,252 from your own savings and the assets you need at that time is $512,821. To reach the assets, and thus the cash flow, needed to pay for your retirement, the money should be invested through the accumulation stage. 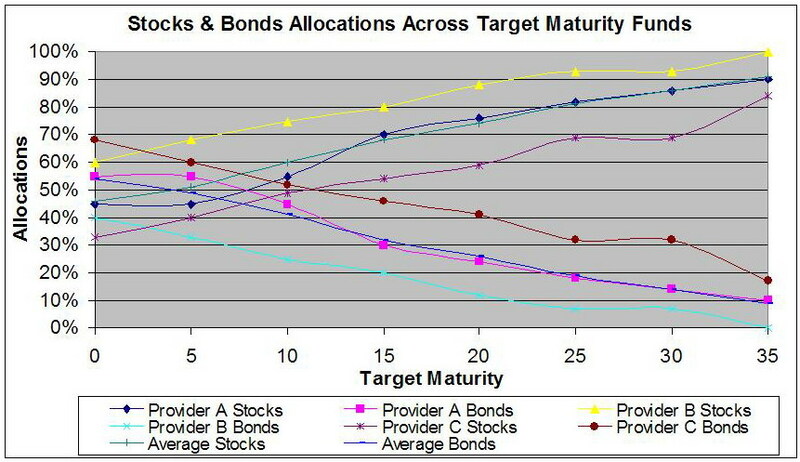 The report then outlines some rough strategies in the allocations of stocks and bonds based on the maturity targets, as shown in the following plot. The asset allocations are quite similar to some typical asset allocations of lifecycle funds. For example, if a person is 30 years old (35 years to retirement), then the average asset allocation is 91% in stocks and 9% in bonds. Five years late, the allocation chages to 86% stocks and 14% bonds. The average asset allocation of lifecycle funds from Vanguard, Fidelity, and T. R. Price for 2040 target date is 86.8% stocks and 9.6% bonds.